Thank you to everyone who sent in contest entries (serious or silly) to vie for a copy of Sense and Sensibility and Sea Monsters. Some of the other suggestions for the contest from last week included St. Michael's spire, Maria's Bistro Mexicano, Polish Delis, and the guy who wanders around pushing a shopping cart and wearing a Lady Liberty foam hat on his head. However, the clear stand-out was an entry that seems strange considering its subject has been such a fixture in Sunset Park. Thanks to Tony Giordano for sending in this photo and explanation about Our Lady of Perpetual Help on 5th Avenue. He explains why such a long-time piece of Sunset Park could still seem "out of place." Naturally, OLPH doesn't need much explanation as to how it adds to the community. The scale of the building is far beyond that of any other building in the community (well, I would have to leave out the Brooklyn Army Terminal and the public housing unit on 4th Avenue & 24th Street)...it is monumental in size and architecture. It is surrounded by extra wide sidewalks on two sides, setting it apart from the two and three story buildings that are nearby. 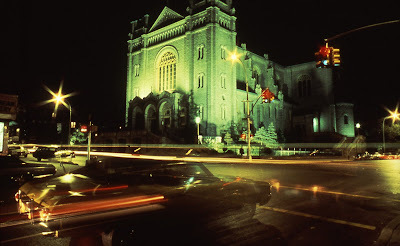 It is designated as not just a church, but a basilica - making it a special structure in the Roman Catholic religion. I believe it may be the largest church structure on all of Long Island - installation of Bishops take place there. While there are over 150 cathedrals in the U.S. there are only 15 basilicas. There are over 20 organizations associated with the building - including a school, youth groups and ethnic groups meeting to support their mutual faith in their native languages. OLPH certainly is unusual for any community and is certainly an important, crucial element of the community. I agree, OLPH is beautiful, and the interior is amazing, espcially the gorgeous upper church! For those who don't know, OLPH is on 59th-60th Streets at 5th Avenue. This section of Sunset Park (high 50's through low 60's) is all-around terrific.